It’s not Beer Can Chicken. It started out to be Beer Can Chicken but after doing some online research I came to the conclusion that cooking chicken stuffed with a can of beer is all about the cooking method and has nothing to do with the beer. Why waste a perfectly good beer if it doesn’t add anything? The first problem we encountered was that neither our Weber nor our gas grill was high enough to hold the chicken sitting on the can. So we would have to use the smoker. If we used the smoker the temperature would not get hot enough to do anything interesting to the beer. It would just sit there as a prop to the chicken. I didn’t think the chicken deserved a quaff-able prop. 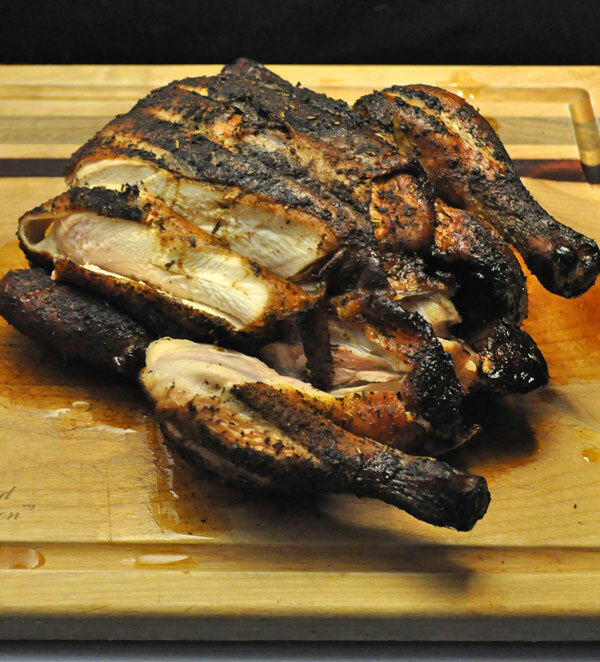 I did, however, liked the idea of a smoked chicken…. And we already had the chicken. Mon mari had the fire a little too hot (he burns wood in the smoker) and it was done in just over 2 hours. It was tender and very juicy, but not as smoky as we would like. Next time we’ll try a slower fire and 4 hours. The instructions assume you have a smoker. 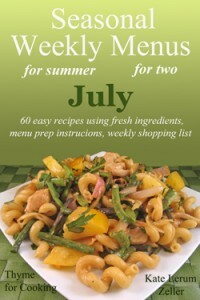 Ours in an inexpensive smoker we’ve had for years – bought at Target. Light a fire in the smoker and put water in the pan. Mix all the ingredients, except chicken. Loosen the skin on the chicken and put some of the spice rub under it. Rub the remaining spice all over the chicken. If there is any left, put it inside. Put the chicken, breast side down, in the smoker, cover and cook. Stoke fire as needed and continue to cook until done. Remove and let rest for 10 – 15 minutes before carving. I continue to struggle with the jungle that is now my potager. 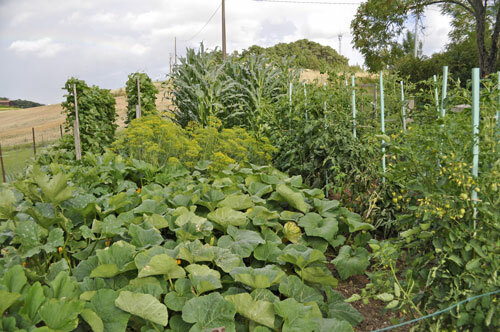 The sweet corn was thigh-high, the beans were just starting to climb, the summer squashes were barely producing and the butternut squash just starting to vine. 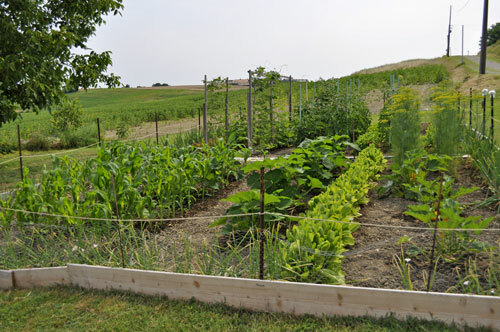 The sweet corn is over my head, the beans grab my neck whenever I get close, and the squashes, both summer and winter are climbing over, under and through the fence. I took the secateurs to the lot today and trimmed it all back. Unlike my mother, who was always very proud of her flowers (and justifiably so) I have never had a strong interest in growing things I couldn’t eat. The rest of the women in my family all have beautiful flower beds. Mon mari, however, has stepped into the void. 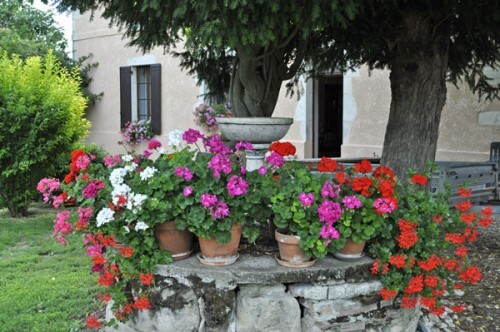 The old well you see below, as well as every window in our house, is filled with geraniums of every color. 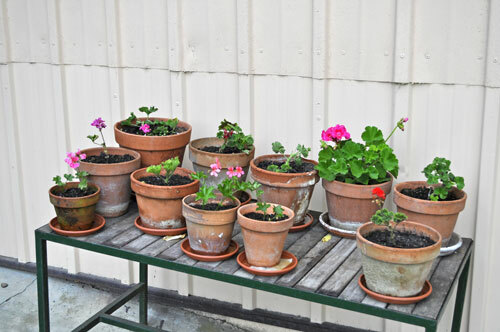 And this is his geranium nursery….. All of the babies he has started from cuttings. It’s a good growing year here. I love your veggies and his flowers! 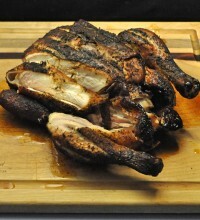 Nothing better than a smoked chicken, even if you wished it was a little more smoked!